Jimmy Bonneau vs Eric Neilson Fight Video · Let's Go Amerks! Jimmy Bonneau played another great game on Tuesday night against the Hamilton Bulldogs and again answered the call when needed. Jimmy Bonneau and Eric Neilson, a couple of old friends from their playing days in the QMJHL reuinited at 5:29 of the second period for a great fight. 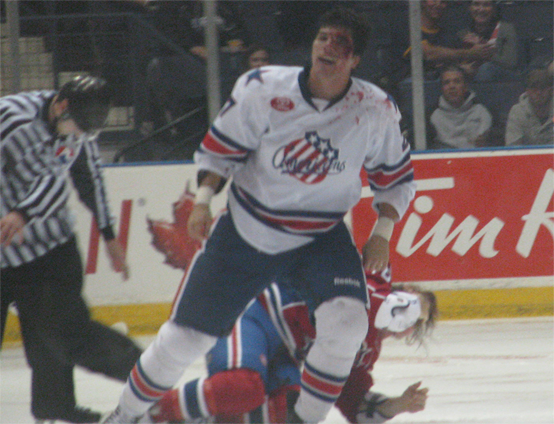 By the time the fight was over both players were cut open and bleeding down their faces. Even though Bonneau signed a standard player contract on Tuesday he told me that he knows his job is never secure and he needs to make sure to play hard every game. Playing hard every game does not mean to just get into a fight, it also means playing a shift when needed and not being a liability on the ice.